lary instruction. Implications for early literacy instructional practice are discussed. among children with weak language skills. approach with positive results, especially for kindergarteners. ondary prevention of vocabulary delay that matters. instructional supplement, referred to as say-tell-do-play (STDP). episodic and limited to relatively easy words (Wright, 2012). the use of similar techniques aimed at secondary prevention. classroom included a teacher assistant. ticed in play activities in activity centers on a dail y b asi s.
sional development in the Early Reading First program. 1978; Heibeck & Markman, 1987; Smith, 2000). to learn new words because it is fun and enjoyable for children. viding an extra dose of direct, intense vocabulary instruction. words. They were asked to point to the target words (Show Me). tered at the end of each week on words taught that week. lary instruction on 3 - 5 topic-related target words each week. 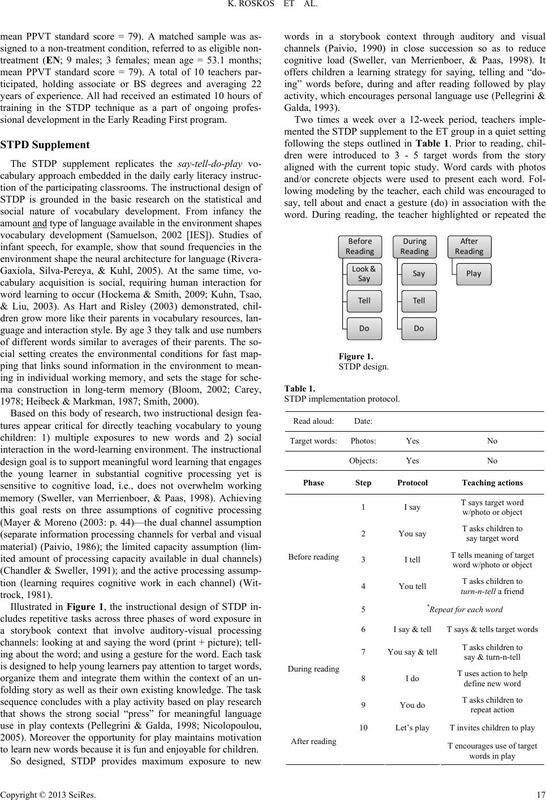 topic-related target words only (See Table 2). on the PPVT and CBDM tasks were calculated as percentages. tified; rating = 2); and low (1 or 0 words identified; rating = 1). established at nearly 100% on a coach sample. gered over the 8-week period (equivalent to 25% of sessions). a mean of 90% per the protocol and a range of 80% - 100%. mately 7 points, giving the ET group about a 6-point advantage. gauging the practical i mpact of the intervention. if such increases hold or even improve significantly. progress monitoring tasks of Show Me and Tell Me. Scatter plot of EN and ET pre/post PPVT standard sc ores. ences, and need to be tested for significance with a larger sample. and verbalized about half the words after a week of instruction. Percentage of target words identified in CBM. 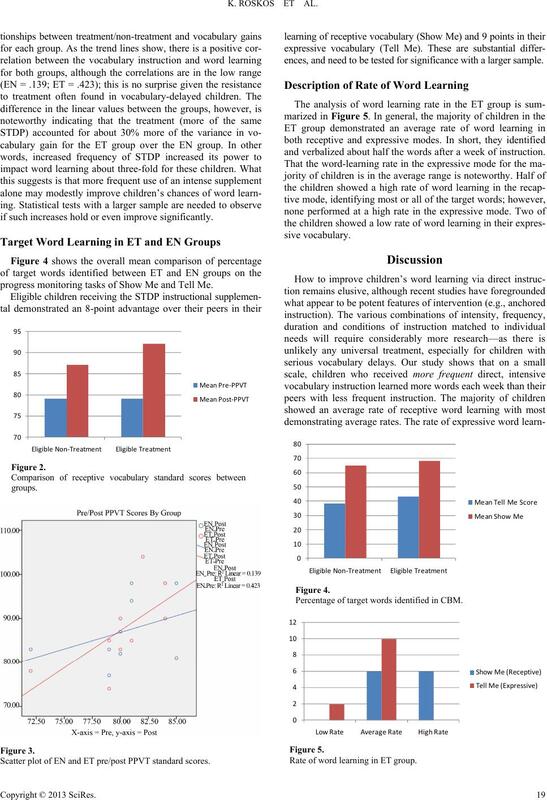 Rate of word learning in ET group. show promise for vocabulary intervention in classroom settings. meanings (Bus & Verhallen, 2009). neously, thus boosting their own self-agency with language. may be met through computer-based instruction. 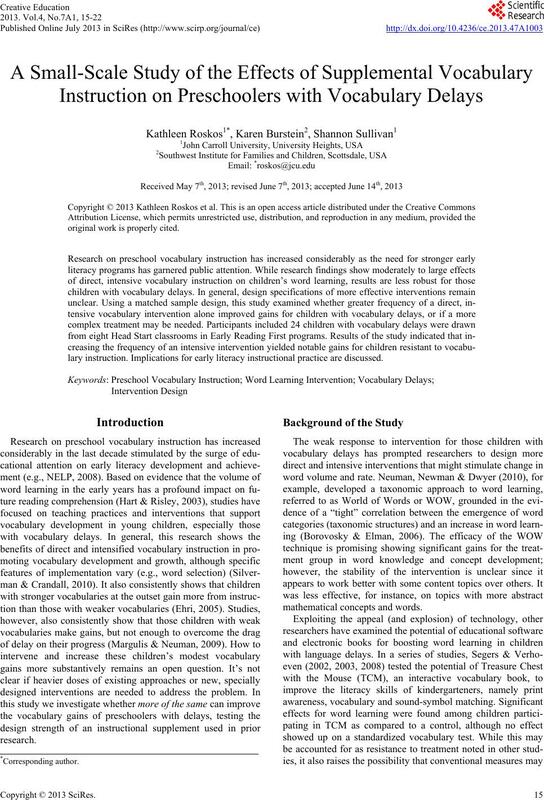 tion approaches with children at-risk for vocabulary delay. attrition, and attendance was not accounted for in the analysis. learning of vocabulary-delayed youngsters in a practical way. viable factor for boosting response to treatment. names for things . 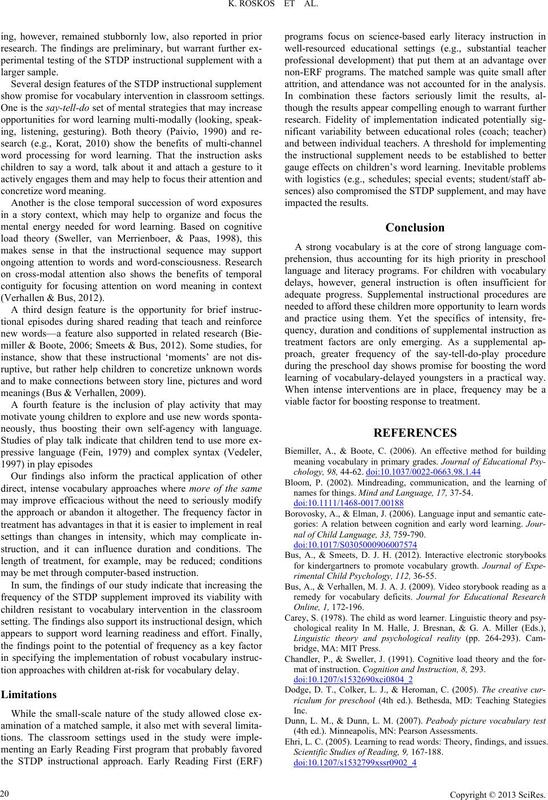 Mind and Language, 17, 37-54.
nal of Child Language, 33, 759-790.
rimental Child Psychology, 1 1 2 , 36-55.
mat of instructio n. Cognition and Instruction, 8, 293. (4th ed.). Minneapolis, MN: Pearson Assessments. Ehri, L. C. (2005). 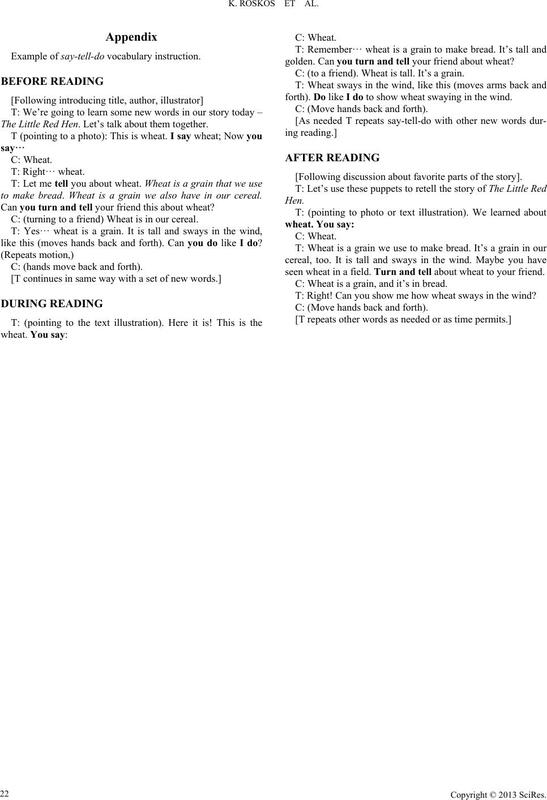 Learning to read words: Theory, findings, and issues. 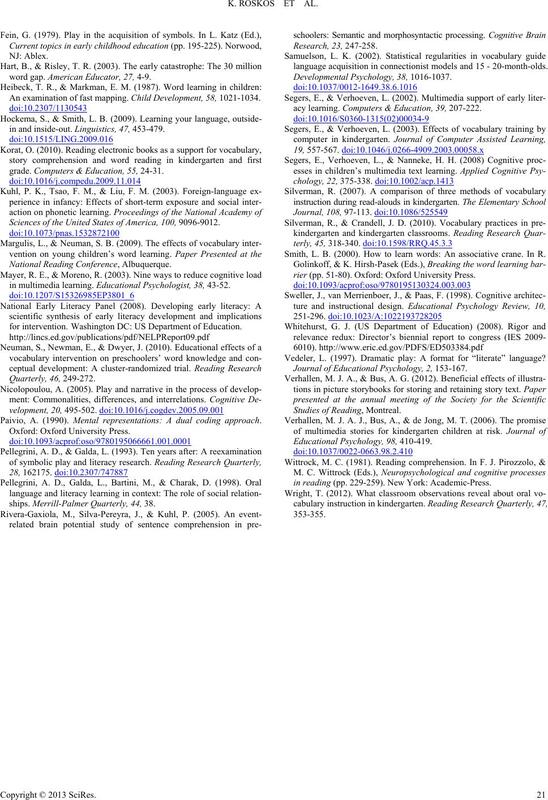 Scientific Studies of Reading, 9, 167-188.
word gap. American Educator, 27, 4-9. An examination of fast mapping. Child Development, 58, 1021-1034.
in and inside-out. Linguisti c s , 47, 453-479.
grade. Computers & Education, 5 5, 24-31. Sciences of the United States of America, 100, 9096-9012. National Reading Confere n c e, Albuquerque. in multimedia learning. Educ at i onal Psychologist, 38, 43-52.
for intervention. Washington DC: US Departme n t o f Educati on . Paivio, A. (1990). Mental representations: A dual coding approach. ships. 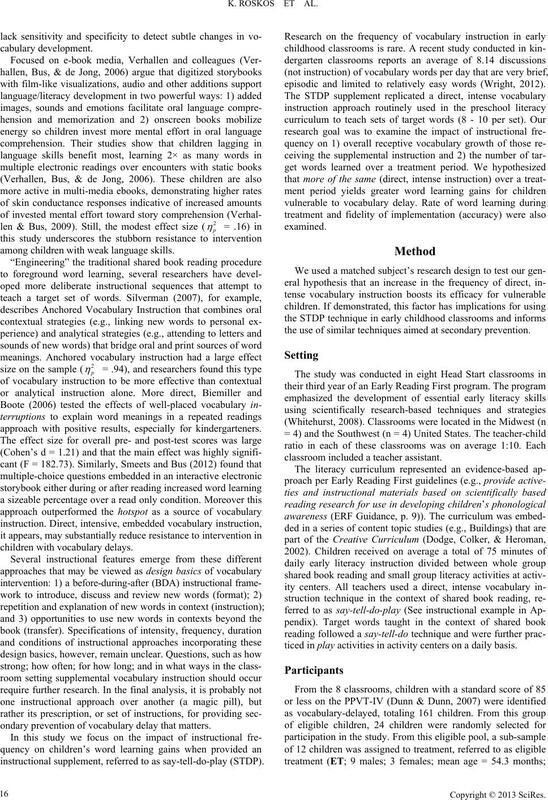 Merrill-Palmer Quarterly, 44, 38.
language acquisition in connectionist models and 15 - 20-month-olds. acy learning. Computers & Education, 39, 207-222. Smith, L. B. (2000). How to learn words: An associative crane. In R.
rier (pp. 51-80). Oxford: Oxford University Press. Vedeler, L. (1997). Dramatic play: A format for “literate” language? Journal of Educational P sychology, 2, 153-167.
in reading (pp. 229-259). New York: Academic-Press . Example of say-tell-do voca bulary instruction. The Little Red Hen. Let’s talk about them together. to make bread. Wheat is a grain we also have in our cereal. Can you turn and tell your friend this about wheat? C: (turning to a friend) Wheat is in our cereal. like this (moves hands back and forth). Can you do like I do? C: (hands move back and forth). golden. Can you turn and tell your friend about wheat? C: (to a friend). Wheat is tall. It’s a grain. forth). Do like I do to show wheat swaying in the wind. C: (Move hands back and forth). [Following discussion about favorite parts of the story]. seen wheat in a field . Turn and tell about wheat to your friend. C: Wheat is a grain, and it’s in bread. T: Right! Can you show me how wheat sways in the wind?